BGS 14 - Black Girl Magic Can't Stop Won't Stop! | Black Girl Squee! BGS 14 - Black Girl Magic Can't Stop Won't Stop! In episode 14 of Black Girl Squee, Inda Lauryn (@indascorner) and Didi Jenning (@dustdaughter) return from hiatus to celebrate a whole bunch of Black Girl Magic! Inda Lauryn has a new story on Amazon! Getchu a copy right here. We talk about Tonya Pinkins and #BlackPerspectivesMatter. 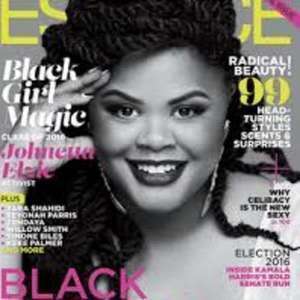 Johnetta Elzie gracing the cover Essence Magazine. More Black Women are joining the podcasting ranks - voices like Reagan Gomez Preston and Kiddotrue are needed and welcome! Crowdsourcing Black Girls in Independent Media project We also talk about Taraji at the Golden Globes and on Elle Magazine (which also shows up in Catch the Fade later). In our main topic, we talk about Black Women Geniuses specifically in music from the 70's to now. We have a few repeats in our DWIDP but we think you'll enjoy it. Support Inda here. What Black Girl musical Geniuses did we miss? Let us know by tweeting us @blackgirlsquee, emailing us at blackgirlsquee at gmail dot com or sending us a message on our Tumblr at blackgirlsquee.tumblr.com/. Leave us a review on iTunes and we'll read it on the show.